While I love me a good gift guide – and don’t worry – there are some good ones coming your way, this year I’m also making a major point to shop local for the holidays. You guys, this retail game is tough and while all things Target are well and good, there are small makers, artists, designers and visionaries that need and, I would argue, deserve our support. So yes, I’ll still share my favorite Cyber Monday deals with you, I also want to make sure you learn about some bricks & mortar shops I adore. Case in point, the new and totally stunning Kamperett showroom that recently opened in San Francisco’s Mission district. I’ve talked about Kamperett around here before. Designed & made right in the Bay Area, this clothing line creates ephemeral but strong pieces that have that perfect amount of edge. Every collection leaves me in awe and the the latest is no exception. From jumpsuits to wrap dresses, high waisted culottes and a crazy good wool blazer, this is the wardrobe for a modern woman. Everything is simple and classic but also head turning. Dresses are made with sheer panels. Pants have the perfect cropped hem. The dresses have a gorgeous flow. And while much of the winer collection is in my favorite neutral color palette. they’ve peppered in yummy metallics and even a velvet in chartreuse! But everything has a timeless cut so these are the pieces you’ll love wearing now and will keep for years to come. 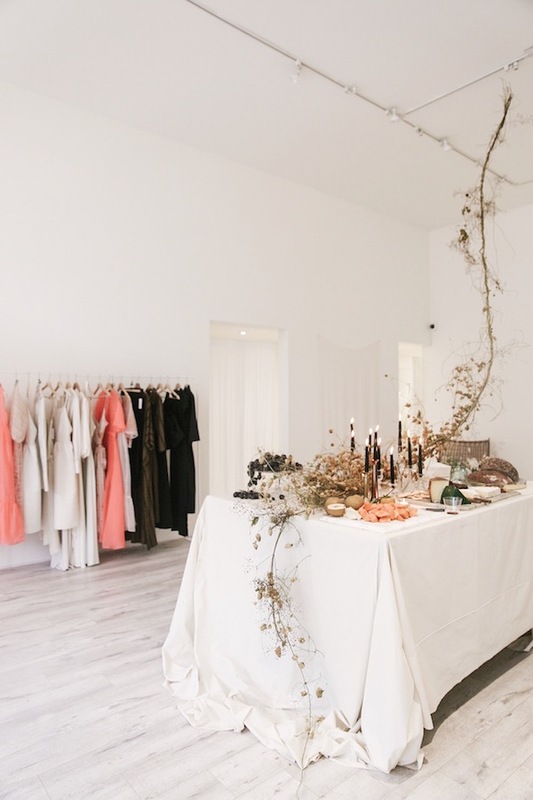 While I’ve always loved their clothes, it’s Kamperett’s minimalist showroom that has my heart swooning. Now you can go and play dress up in their beautiful light filled space that is both design studio and showroom, just in time for holiday party season! I promise there’s more than a dress or two you’re going to want to go home with. Spoiler, those gold pants came home with me! In our world of mass consumption and fast fashion – I love the idea of filling my closet with pieces from a limited collection – that are designed and made with exceptional care. I thought you might like that too!